School, District, State, National level Painting, Essay writing Competition 2017 on Swachh Bharat. National Level Essay, Painting competitions across all the schools on the occasion of Teachers Day i.e. 5th September, 2017. The Central Water Supply and Sanitation Ministry is going to conduct the national level competitions on Swachh Bharat. Prime Minister Narendra Modi's call for removal of dirt from the country by 2022 is part of the competition for primary level students. The competitions will take place till September 8 under the slogan 'Swachh Sankalp Se Swachh Sankalp Siddhi'. 'What will I do to make India Clean?' is the subject of the essay. 'Clean India of my Dreams' is the subject of drawing competition. The winners will be awarded national Swachh Bharat Awards on the 2nd of October. The Hon'ble Prime Minister has suggested to promote the message of Swachhta on a massive scale and engage smart, young minds in the Swachh Bharat Mission through national level essay and painting competitions organized across all the schools on occasion of Teacher's Day i.e. 5th September, 2017. This initiative would ensure a structured participation of the school children, youth in the programme and bring in fresh ideas, energy and enthusiasm to the Mission/Swach Sankalp Se Swach Sankalp Siddhi . Theme: The theme of the Essay Competition is proposed to be "Mai Swach Bharath ke liye kya karunga/Karungi (What will I do to make India Clean)" while that for Painting Competition is proposed to be "Mere Sapno kaa Swach Bharath(Clean India of my Dreams)". Essay should be maximum of 250 words and its language should be in the medium of instruction of the school concerned. It is, accordingly, recommended that every school strongly encourages all students to participate in the essay and painting competition. The submission in the competition may cascade up from the Village, District and State level to the Centre. The best three entries for each competition i.e. painting (for Class I to V) and essay (one for Class VI to VIII and other category for Class IX to XII) may be rewarded suitably at all levels i.e. School, District, State and National level. The best Essays (three each from two categories) and the best three paintings from the school should be reported to the district administration. All the best entries of each school shall be evaluated at district level by the District Collector who shall constitute a committee to choose the best entries of the district in each category and get them awarded on 2nd October, 2017'. In a similar manner, the best entries (three in each category) of all the districts shall be evaluated at State level and for this purpose State Education Secretary shall be responsible to constitute a committee. The state evaluation committee shall choose three best entries each in Essay and Painting competitions and award them on 2nd October, 2017. 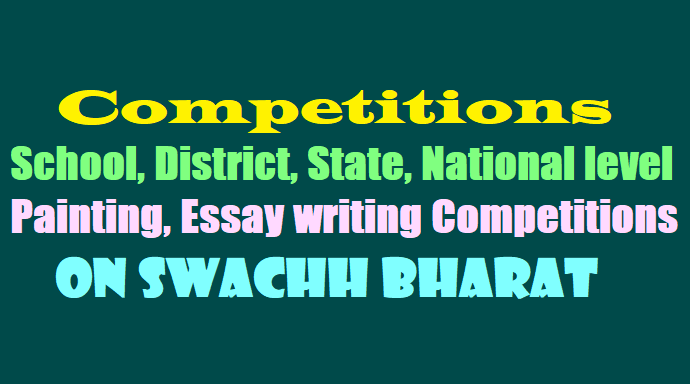 Subject: "Mere Sapno kaa Swach Bharath(Clean India of my Dreams)"
Subject: "Mai Swach Bharath ke liye kya karunga/Karungi (What will I do to make India Clean)"
The States are required to scan and e-mail state level winning entries (essays) and district level winner paintings to swachhsankaloessavsp@gmail.com by 20th September, 2017.